I have a very vivid memory of standing in my friend's kitchen in Astoria back when I was living in New York City. Her then boyfriend (now husband) was just staring at me with a confused look on his face. He finally explained "I just realized that, until this moment, I had no idea how short you were. I don't think I've ever seen you not wearing heels." My physical height may be 5'2", but inside, I feel like I'm 5'9". I've always welcomed every physical inch I could add and for most of my twenties, I treated a pair of heels the way some women treat mascara: I never left the house without them. But something has shifted since I turned the corner into my 30s and moved out west. While I still love my stilettos, I've found that I feel much more me on a trail than in a boardroom. If you had asked me even 5 years ago if I could get as excited about a pair of Danners as a pair of Choos, I would have laughed in your face. Now, not so much. Over the years, especially when my work-life balance was thrown completely off, I found my body craved the great outdoors. I'm increasingly desperate to be anywhere I can trade in fluorescent lighting for sunlight and popcorn ceilings for blue skies and tree branches. These days, I feel the most me with dirt on my socks and a map in my backpack. I treat hiking as a walking meditation. When I'm on the trail, everything else just melts away, and I'm finally truly present. Especially when I'm exploring a new trail or park, everything I encounter I get to see for the first time, which grounds me in the present moment. As I'm walking, I can't help but be mindful. Of the twists and turns of the terrain before me. Of the trees and branches to my left and right. Of the birds foraging for food in the brush. Of the clouds as they glide across the sun. Of how my body feels as I ascend and descend, of my breath as I climb up and over rocks or down into a dry arroyo. All that I have to focus on is breath and where I am at that exact moment, and it's wonderful. One of my intentions for 2018 is to incorporate hiking (and just being outdoors in general) into a regular practice, as opposed to how I've treated it in the past (as spiritual CPR). Thankfully in Phoenix, we enjoy perfect weather 9/12s of the year and we live within a few hours drive of some of the most amazing hiking spots in the country. There are also two primary types of trails in the park: short, paved, and handicapped-accessible and long, dry and rugged. Day 1, I wanted to hike at least part of the Hugh Norris trail. It's 2.6 miles to where the trail intersects with the Sendero Esperanza Trail, another 1.9 to Amole Peak, and finally, another .3 to Wasson Peak, so about 10 miles there and back. The trail begins and ends with steep crisscrossing sections of switchbacks as you ascend up the ridge...and I actually had to cut my hike short because I had finished the majority of my water after this first mile of steep incline #trailfail Even though I knew the trail would flatten out substantially in the middle, I also knew I wasn't prepared to hike the whole thing safely and comfortably. The complication? I had forgotten my hiking pack back at my apartment in Phoenix. It's light and sleek but can easily carry 4-5 quarts of water. I was making due with a tiny faux-leather backpack I had found at Target that barely accommodated three 16 oz bottles. 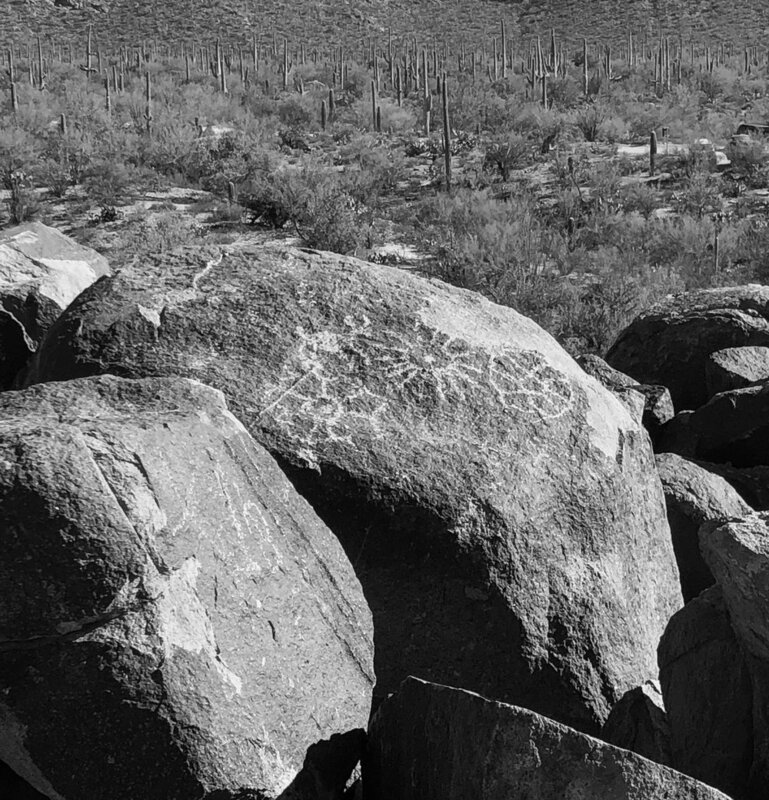 I was at least able to ascend the first ridge, though, and have definitely marked this hike as "to be continued..."
Petroglyphs as seen from the Signal Hill picnic area.